Houston alumnus Rob Johnson, SPA/BA '81, proudly serves the Eagle alumni family as a member of the SPA Dean's Council, and as Awards and Scholarship Committee chair for the AU Alumni Board. We recently caught up with Rob to learn why he keeps close AU ties through his participation in Houston recruitment events, SPA and Alumni Board activities, reunions, charitable giving and good ol' storytelling. AU: Can you tell our fellow Eagles a bit more about yourself, your family, profession, and passions? 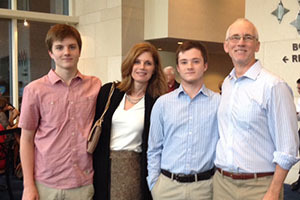 Rob: My wife, Christine, and I have two great sons –one is a college sophomore and another will be entering his senior year in high school, and two border collies. I'm proud to say that both our sons were members of their high school marching band and Eagle Scouts. After law school, I was in private practice in DC, and then joined Mobil Corporation. Here at Exxon Mobil Corporation, I am Assistant General Counsel, and my responsibilities include leading a team of more than 50 lawyers and associated support staff, and serving on the ExxonMobil Law Department Management Committee. My areas of responsibility including environmental & safety, labor &employment, global procurement, and real estate, as well as developing our professional staff. It's important to me and our company that we keep great people in the Exxon Mobil family. AU: Houston, Texas is very different from Spring Valley. Is that "home"? Rob: It is now, but I was the oldest of four kids raised in Norwalk, Connecticut. (My dad worked in Manhattan.) Of course, DC was home during college and law school, and for a number of years after. AU: Ah…so how did you find out about American University? Rob: I always thought I would be interested in government, politics, or law. I came to D.C. as a kid and was enthralled. Coming to D.C. for school was a must! After I attended a college fair in Hartford, I simply requested information from AU and made my decision based on the pamphlets. We didn't have what kids have today in terms of online research tools and things like that. AU: Well, looking back at AU when you were a student, how has the university changed or stayed the same? Rob: The campus has always been beautiful, so that's the same;but across the board, I have seen other positive changes. Let's start with the infrastructure. It's dramatically different. The Katzen Arts Center alone is a world class museum and instructional space. The new SIS building is really impressive also. I think another huge change is the perception that AU was a "safety" or "commuter" school back in my day, and now, it's a destination and really holds its own with the other very strong DC universities. There's a feeling that we are unique…and strong…and we believe it. AU: We know that you love AU, so much so that you volunteer for two different boards. What excites you about volunteering for AU? Rob: If I had to point to one thing it would be President Kerwin and the culture he has established. For me, institutional culture starts at the top…you have to set a tone. When Dr. Kerwin and Dr. Minar came to Texas to meet with me a few years ago to talk about my thoughts as an alum, I was surprised and impressed they would take the time to reach out like that. That had not happened before. I really feel AU is on the upswing, and everyone wants to be a part of a place that is positive and working to sustain excellence. Plus, I'm at the point in my life where you do think about giving back. In 1981, I didn't understand the importance of networking, and now I want to be a part of it. My wife and I have established an SPA scholarship because we remember what it was like to need help in school. AU: Considering your work for a Fortune 10 company, what advice might you have for students, aspiring lawyers, and young alumni? Rob: If you're still a student, results matter. Work hard, and broaden yourself. Challenge yourself to new experiences. They may lead to new avenues that have never before been walked. Be externally engaged, and by that I mean be intellectually curious and willing to widen your reach. For the aspiring lawyers, be serious that it is what you want to do. It's more than just being smart, and you have to be honest with yourself that this is something you want to work hard at. For young alumni I'd say don't be afraid of not liking your first job. You're going to get another... get out there and do it...take chances and risk, particularly while you're young. And, network, network, network. Personal connections matter very much, no matter how much great technology we have at our fingertips.